Construction of the stationary winding engine house was depicted by the artist John Cooke Bourne in April 1837. 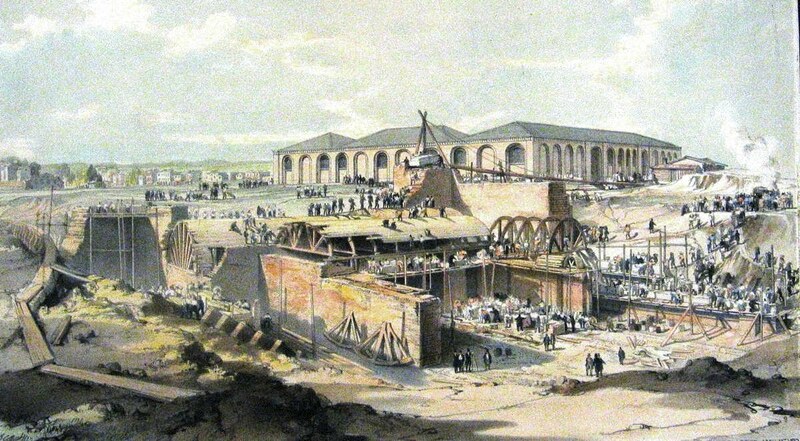 His watercolour drawing, drawn from the site of Fitzroy Bridge over the Regent’s Canal on Gloucester Avenue, shows the walls partly completed and centering being erected for the vaults. The Locomotive Engine House is shown beyond. The stationary winding engines started service on 14 October 1837. 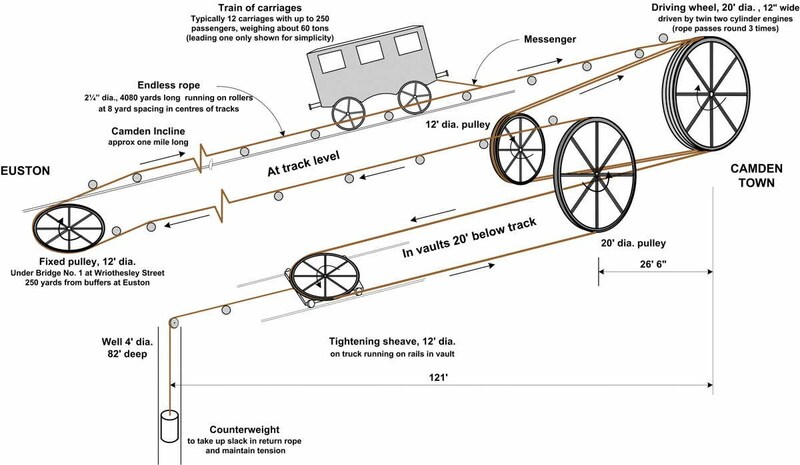 From then until 1844, trains of up to 12 coaches weighing about 60 tons were worked up the Camden Incline by an endless rope that ran around a 20 ft driving wheel and other large sheaves and pulleys. At a maximum speed of 20 mph the driving wheel rotated at 30 rpm. The tarred hemp rope 4080 yards long was kept taut by means of counterweights sunk into a well at one end of the vaults. The mechanism is illustrated schematically in the figure. Only the eastern pair of lines was so equipped, the western pair, originally intended for the Great Western Railway, being worked by locomotives when the rope system was not available. The motive power was provided by two condensing beam steam engines of 60 hp, working side by side on a common shaft, housed in a stationary engine house. The pulley system could not cope with the sharp curve at the Euston platform end. On the outward run porters (soon replaced by a locomotive) pushed the loaded coaches 250 yards (230 metres) down the slight incline to the start of the endless rope located at a pulley under the first bridge. The leading coach was attached by a short length of rope called the ‘messenger’ to the endless rope. 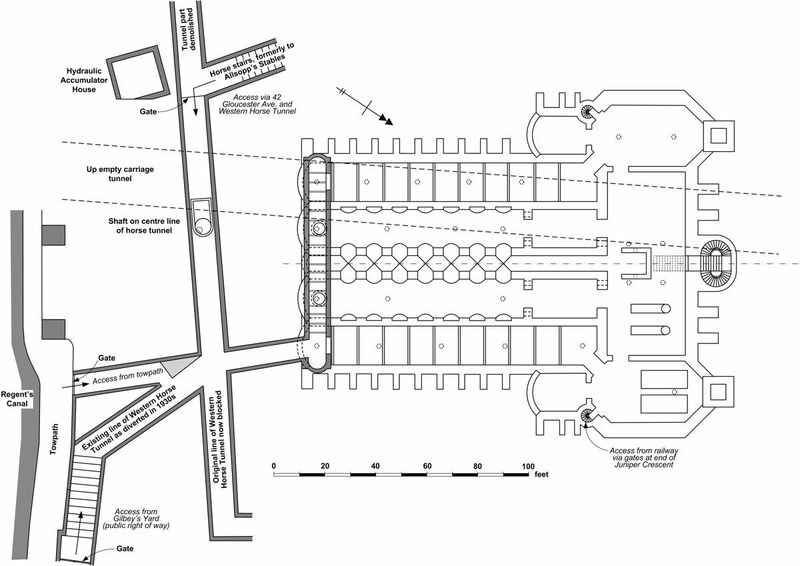 Guards at Euston were able to signal to the winding engine controllers by means of a pneumatic telegraph, an organ pipe operated by compressed air. It took 3-4 minutes to draw the train over the mile or so from Euston to Camden. By 1843 mail trains had started to be worked by locomotive on the spare lines, and after 1844 larger locomotives were used to haul trains from Euston, usually with a second locomotive either in the front or ‘banking’ by pushing in the rear. The gradient always gave them difficulty, and not until the days of diesel and, later, electricity did the gradient became insignificant. The plan of the stationary engine house is symmetrical. It measures about 170 ft (52 m) long by 135 ft (41 m) wide. Only the eastern half of the engine house was fully equipped with machinery, the western half, intended for the GWR, being redundant. The boilers were supplied from coal stored in vaults 116 ft (35 m) long, 15 ft (4.6 m) wide and 20 ft (9 m) high running south-east towards the Regent’s Canal. The boiler rooms are 44 ft (13 m) long by 24 ft (7.3 m) wide, with workshops of 20 ft (9 m) by 15 ft (4.6 m) on their south sides. Two marine boilers 18 ft (5.5 m) long, 7 ft 6 in (2.3 m) wide and 8 ft 9 in (2.7 m) high were installed in the eastern boiler room. Two twin flue circular boilers 20 ft 6 in (6.2 m) long and 7 ft 8 in (2.3 m) diameter were installed in 1838 in the western boiler room with 100 ft (30 m) of 9.5 in (240 mm) connecting steam pipe. Beyond the boiler house is the transverse vault, 72 ft (22 m) long by 30 ft (9 m) wide, which housed two Maudslay, Sons and Field condensing beam steam engines working side by side on a common shaft driving a flywheel. The cylinders were 43 in (1090 mm) diameter, with a stroke of 48 in (1220 mm). Three openings on the south side of the engine vault lead to long vaults, two of which are similar in size to the coal stores and housed the rope tightening mechanisms. At the far end of these vaults were the wells into which the counter-weights were sunk. The central vault is 6 ft (1.8 m) wide with seven arched openings to the rope tightening vaults on either side. The floors are invert vaults. 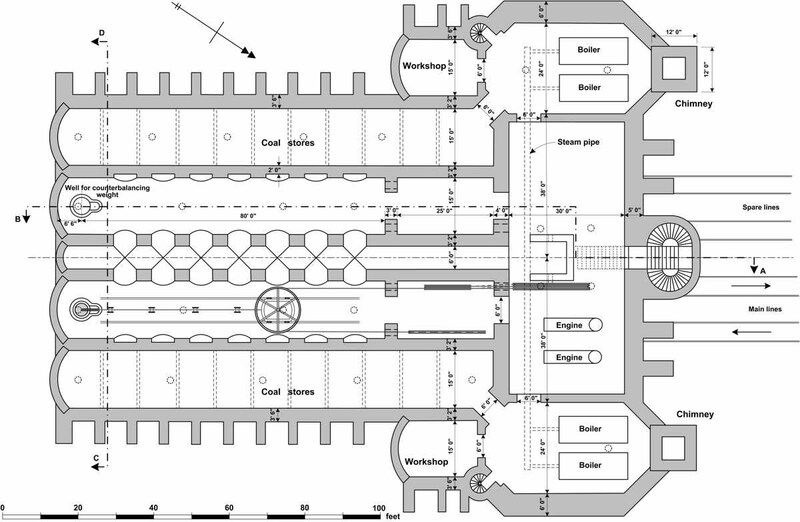 The arrangement of the pulleys and tightening mechanism is shown in the plan and longitudinal section. The chimneys, rope openings, vent holes, staircases down to the boiler and engine rooms and boiler rooms, encircled with palisades, were the only surface evidence of the work going on below ground. The boiler rooms were built to be open to the atmosphere, and were only vaulted after the end of operations and the removal of the equipment. On the north side of the transverse vault is a staircase used for communicating with the signalman who supervised the movement of trains up the Incline. The Camden Incline had been a trial site for Cooke and Wheatstone’s electric telegraph, which established the principles for railway signalling, having been introduced by Robert Stephenson on 25 July 1837, only one month after it had been patented. However, it was rejected by Stephenson for signalling on the Incline in favour of the pneumatic telegraph. Coal (anthracite) was transported by canal, offloaded at the rail bridge over the canal, and taken by trucks running on light rails through a tunnel connecting the towpath to the coal stores. Operations staff consisted of an engine man, three stokers and cleaners. How the vaults were kept dry is not clear, but the effectiveness of the puddled clay canal lining and a large borehole for water supply will have contributed. The stationary engines and associated equipment were auctioned in 1847 and found useful employment at a Russian flax mill and silver mine. The two chimneys were demolished in 1849, and the empty underground vaults simply sealed up.